Grapes ripening in 99-degree heat in Gauriac, France. 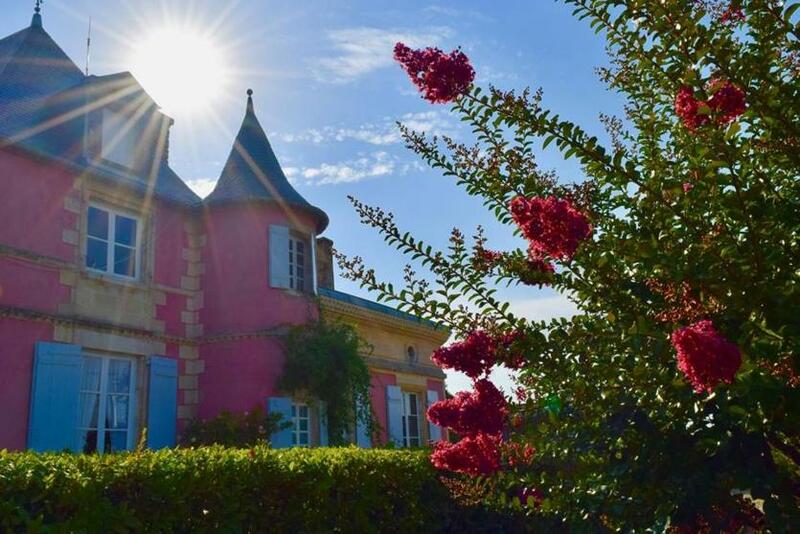 BORDEAUX, France — The idea of a river cruise filled with hiking and wine tastings in southwest France charmed the knickers off of me immediately. I love hiking. I love tasting wine. I can’t resist France. It seemed that the only things missing were raindrops on roses and whiskers on kittens. But something else was on the itinerary, and it wasn’t one of my favorites things: The epic European summer heat wave of 2018. As the departure date of my August river cruise approached, I read about forest fires in Greece and Sweden. Moscow opened cooling centers. In Bordeaux, where my wine and hiking cruise began and ended, the temperature was a consistent 99 degrees. Sorry, I’m exaggerating; there was one day when it only hit 98. I braced myself for a different kind of cruise, one where the jaunty French hiking wardrobe I had carefully acquired would be replaced by (shudder) moisture wicking fabrics. Is there anyone who finds the description “moisture wicking” pleasing? This is how it began when I boarded the MS Cyrano de Bergerac for a week of cruising on the Gironde Estuary. The estuary is where the Garonne and Dordogne rivers meet. It’s the port of entry to the gorgeous city of Bordeaux from the Atlantic. The region is renown for its vineyards, wineries, and fishing. The Cyrano de Bergerac, operated by the French cruise line CroisiEurope, has just 87 cabins with a capacity of 174 passengers. Of the 170 or so passengers on my cruise, only nine of us spoke English as a primary language. The dearth of English made the experience feel like a boozy, immersive French class. Of the English speakers on board, only four of us lived in the States. It seemed I would at last find an escape from political discussions — at least for six days. But I didn’t book this cruise because it offered an opportunity for a potential political blackout, or even for the wine that would be flowing like the river beneath me. OK, maybe for the wine. But I was most intrigued that the focus of the cruise was hiking. Allow me to clarify: I was intrigued by the hiking before I learned that it would be hot enough to cook crêpes Suzette on the sidewalk. Still, I’d never heard of a cruise that stopped at a different port each day for guided hikes and exploring. 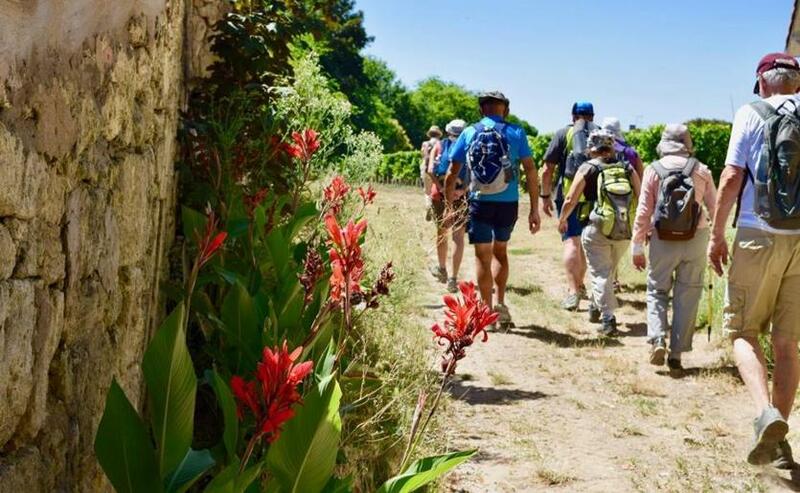 Hikers from the MS Cyrano de Bergerac make their way through Pauillac. The hikes were on primarily flat terrain and not terribly long. Most were about 6 or 7 miles and traversed vineyards and small, medieval towns that were dotted with large chateaus. The towns had emptied out for summer holidays. Only fields of flowers, choirs of cicadas, and crumbling Romanesque churches remained to greet us. The heat wasn’t noticeable on the ship thanks to ace air-conditioning and river breezes. But as we disembarked for our first day of hiking, I was sucker punched by a wall of white heat. A curtain of sweat descended over me after five minutes in the sun. The sheen of carefully applied sun block melted into a pale milky paste. I looked like a dripping ghost in a moisture wicking shirt. Yes, that’s as gross as it sounds. But this is where I’ll stop complaining, at least for the next few paragraphs. Our guide, a man who has led these hikes for the past 14 years, made sure we were hydrated, stopped regularly for shade breaks, and gave us a bit of history and context about our surroundings. There were times I wish I could have been carried, Cleopatra style, but then I’d glance at some of the robust octogenarians on the hike and realized that perhaps I was being a bit dramatic. We wound through tiny villages such as Saint-Seurin-de-Cadourne and Saint-Yzans-de-Médoc, stopping at the 17th-century winery Château Loudenne for a tour and tasting. No, it wasn’t quite the blithe and breezy day I imagined, but I was still in the French countryside, hiking and tasting wine. “These are a few of my favorite things,” I repeated to myself whenever heatstroke threatened to overcome me, or when I was feeling sad. But by simply remembering my favorite things, I didn’t feel so bad. The 17th-century winery Château Loudenne is located in the tiny town of Saint-Yzans-de-Médoc. I had never been on a river cruise, but self-described sophisticates have told me for years that they’re the only way to sail. To me, comparing ocean and river sailing feels like comparing pomegranates to pears. Particularly sailing on the petite Cyrano de Bergerac. Unlike some of the massive ocean liners, this boat had one dining room and there was one seated meal service for breakfast, lunch, and dinner. Some gluttonous cruisers may find that disagreeable, but a gluttonous cruiser probably wouldn’t be on a hiking cruise in the south of France. I had no problem with the single dining room option. When you have French chefs preparing your meals, you’re going to wind up with a very respectable duck confit, warm Reblochon cheese in puff pastry, and crêpes Suzette (the kind that aren’t cooked on a 99-degree sidewalk). I was seated with English speaking passengers — a couple from Houston, and a pair of sisters-in-law, one from Toronto and one from New York State. As so often happens on these cruises (at least to me), the bonding came fast and furious, and by the second day we were all close hiking companions. It didn’t hurt that wine and spirits were free on this cruise, unless you opted for fancy top-shelf beverages. Conversation flowed easily. Someone at the table (name redacted) said their brother once owned a leather fetish store. Another of my new friends (name heavily redacted) apologized for voting for Donald Trump. At this I waved for the waiter to bring another bottle of wine. I’d like to say the more we hiked the more I acclimated to the heat, but sadly it didn’t happen. However the beauty of the river cruise is that the boat docked at night and traveled during the day, so I could head out and explore towns after dinner when the temperature was a more reasonable 86 degrees. 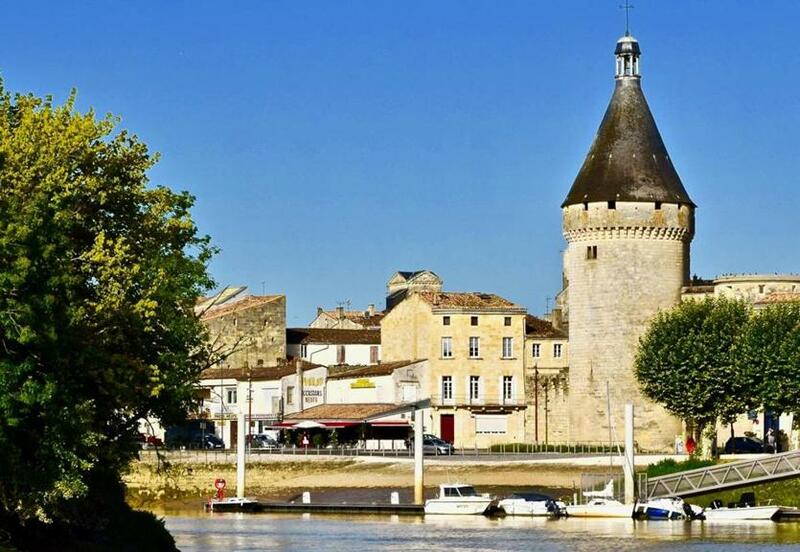 A view of the town of Blaye, France, from the Gironde Estuary. A shop inside the 17th-century Citadel of Blaye. The heat and the unflattering breathable clothing was a small price to pay for the beauty of walking through the region and spending time with my new friends. We explored the 17th-century Citadel of Blaye, an elaborate, impressive fortification designed by Sébastien Le Prestre to protect Bordeaux from ships entering the estuary from the Atlantic. 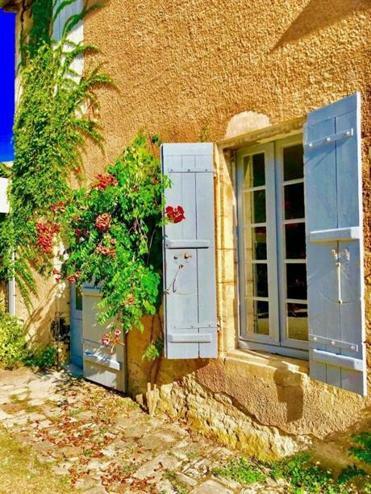 Before we arrived back in Bordeaux, we spent a day in Saint-Émilion, a UNESCO World Heritage site built on a hill, which made for incredible views of the narrow streets, tile rooftops of the medieval village, and the sea of vineyards that stretched around it. One of my shipmates described it best when he said “It looks like something out of Disney World, if Disney World was real.” There was more hiking, more wine tasting, and a lot more sweat. I don’t think I’d ever worked this hard for wine. Bordeaux is a three-hour train ride from Paris, and even if you’re not keen to take a river cruise, I recommend making the trip here the next time you find yourself in France. I was impressed by the cultural offerings, the cuisine, the chic shops, and, yes, the wine. In other words, I finished the week with a few of my favorite things. Five-day, non-hiking Bordeaux cruises through CroisiEurope start at $1,500 per person. A six-day hiking cruise on the borders of France, Germany, and Switzerland starts at $1,670 per person. 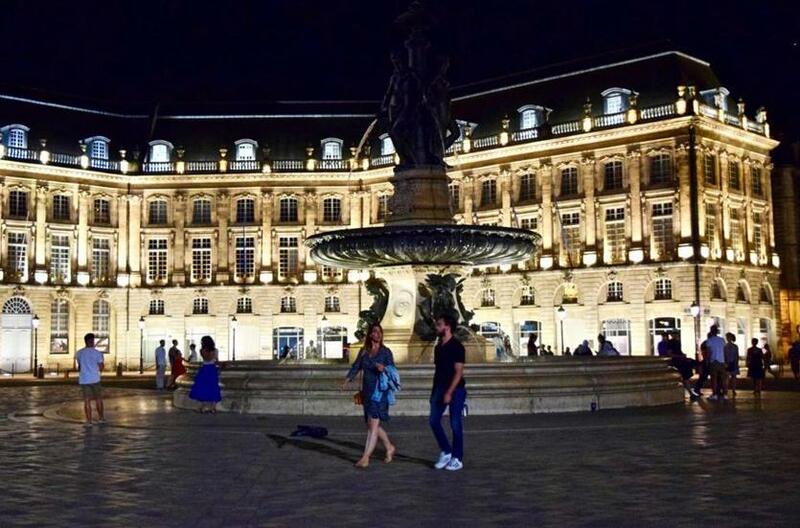 The Place de la Bourse in Bordeaux on a balmy summer night. Christopher Muter can be reached at muther@globe.com. Follow him on Twitter @Chris_Mutherand on Instagram @Chris_Muther.